THIS UPDATE IS ONLY FOR WINGS OVER FLANDERS FIELDS EXPANSION 3 (known as WOFF3) The above is the MAIN UPDATE FOR WOFF 3 ONLY. DO NOT USE ANY OF THESE UPDATES ON WOFF ULTIMATE EDITION! Please see: WOFF 3 “History of changes” section below for more detailed info on what has changed. After install it will show as Version 3.12 - 4239 in Workshop area (bottom of page). For other versions of WOFF see click the Download button above in the page menu. NOTE THIS IS AN UPDATE ONLY, IT REQUIRES YOU TO OWN THE ACTUAL WOFF 3 EXPANSION AND HAVE IT INSTALLED BEFORE USE. INSTALL INSTRUCTIONS: IMPORTANT: Make sure you exit WOFF completely. Download the required update / patch, and save it to a folder on your hard drive. Make sure it has fully downloaded (check the size is correct). Then open the zip file. You must "Extract" or copy the file inside the zip to a new folder location on your hard drive - do NOT try to run it fro within the zip. In Windows Explorer browse to the folder you extracted the file too, and double click on the new update patch file to install the patch. (Windows 10 : if you get a pop up titled "Windows protected your PC" click on "more info" and then click "Run Anyway" to run it). Follow the prompts to install, and update your chosen product to the latest version. Once completed successfully run WOFF and go to Workshop menu, check the add-on version bottom left area it should display the new version, or for WOFF Expansion patch, check the version in bottom right of the workshops screen. See above for the version number or the WOFF 3 History of changes. 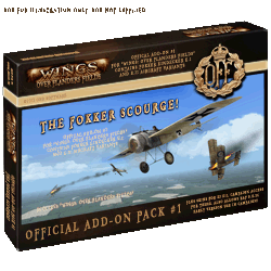 ADDON #1 - FOKKER SCOURGE UPDATE V 5.0 3 May 2016 Download: click icon Zip file size 31.0 MB (32,570,577 bytes) Contains updates for the original Add-on #1 Please see: Add-on # 1 history of changes for more detailed info. IMPORTANT NOTES: You need WOFF EXPANSION 3 installed before you can use this particular update for Add-on #1 as it relies on WOFF 3 features to work. Zip file size 47.8 MB (50,149,968 bytes) Contains updates for the original Add-on #2 Please see: Add-on # 2 history of changes for more detailed info. NOTE: Just install it over your current version of Add-on #2 Balance of Power, Requires WOFF3 installed. NOTE THIS IS AN UPDATE ONLY, IT REQUIRES THE ACTUAL ADD-ON TO BE INSTALLED BEFORE USE. Contains updates for the original Add-on #3 Please see: Add-on # 3 history of changes for more detailed info. NOTE: Just install it over your current version of Add-on #3 MOTLEY CREW Requires WOFF 3 installed. NOTE THIS IS AN UPDATE ONLY, IT REQUIRES THE ACTUAL ADD-ON TO BE INSTALLED BEFORE USE. (click mouse to remove this overlay page). WINGS OVER FLANDERS FIELDS EXPANSION V 3 (WOFF 3) History of Changes : * NOTE: Latest WOFF Expansion 3 updates/patches always includes ALL previous ones * * So normally you only ever need the latest patch to get fully up to date for WOFF EXPANSION 3 ! YOU MUST HAVE WOFF EXPANSION 3 INSTALLED TO USE THESE UPDATES: Latest additions shown first: 20 September 2016 Version 3.12 4239 1) RFC-85 squad fixed (caused some errors when resolving squads). also includes all these previous updates; 28 July 2016 Version 3.11 4239 1) Fixed a missing gun flash in the DVIIF aircraft. 2) Bug in max altitude overrides in Workshops fixed, now missions should be limited to below altitude specified. 15 July 2016 Version 3.10 4239 1) Reduced craft complements slightly in 1914/15 to reduce predominance of 3 craft in a flight. 2) Fixed a bug in craft flight complements for 1916. 3) Fixed an issue with the Fokker D.VIIF skins not showing in runtime. Fixed BMW engine (an incorrect engine was mysteriously fitted previously). The responsible mechanic has been shot as an obvious French spy. 3 July 2016 Version 3.9 4239 1) Fixed a bug in QC weather override - only worked once per session until reselected. 2) Fixed an outcomes file issue pertaining to certain Windows10 Region combinations of the Digit Grouping setting and the Decimal Place Setting 3) Fixed airspeed gauge in Se5a Viper. The responsible mechanic has been reprimanded. 20 June 2016 Version 3.8 4239 1) Added an extra waypoint to landing routes 2) Fixed a bug that prevented the Sopwith Tripe custom/default skins from loading 3) Fixed a squadron suffix 'overuse bug' that could occur under certain circumstances 4) Fixed Esc62 again (ground hog day). 5) Improved waypoint calcs. 6 June 2016 Version 3.6 4239 1) Misc fixes to Se5a Viper (re-wound the clock). 2) Sopwith Strutter default texture skin added for French 1918. So no more British roundels showing if squadron skin does not exist in 1918. 3) Optimised Facility Trees to improve FPS at airfields 25 May 2016 Version 3.5a 4239 1) Misc fixes to Albatros DIII , Albatros DIII early, Hannover and Sopwith Tripe, also Camel Bentley and Camel aircraft models - mainly related to new world cube map reflections and other minor issues. 2) Slightly revised FM for Camel, Camel Bentley and Fokker DR1 aircraft. 3) Airfield complexity setting in workshops added - High Medium and Low - this setting 'scales' numbers of trees, parked aircraft, lights and vehicles at airfields. 4) Fixed an issue where some Fighter squads with certain types of craft could not obtain a suitable mission directive with Historical only Mission types selected in workshops. 11 May 2016 Version 3.4 4239 1) Reverted the Briefing room 'Optional Mission and Alternative Target' functions to V2 state - mission types are no longer 'remembered' on exit of briefing room 9 May 2016 Version 3.3 4239 1) Hannover aircraft model - fixed blue item showing in wing. 2) Fixed missing Fokker D.III cockpit textures for some users. 5 May 2016 Version 3.2 4239 1) Fixed an issue with third party mission types selection causing a registry reset upon sim restart. 2) Fixed some minor issues with the DH4 model. 4 May 2016 Version 3.1 4239 1) Fixed an issue with registry settings not being saved correctly under some circumstances 2) Fixed an issue caused by non-existent in-flight map for North based squads. 3) RFC40 appeared as both a fighter and bomber squad - fixed. INSTALL INSTRUCTIONS: IMPORTANT: Make sure you exit WOFF completely if it is running and wait a few moments. Download the update zip file and open the zip file. Extract the contents to a new folder. Make sure you have WOFF EXPANSION 3 already installed ! Run the application (for example WingsOverFlandersFieldsPhase4_PatchV3.12 or similar named) application by double clicking on it. It should run, and prompt you to continue. After it finishes installing WOFF will be updated to the latest version. if it fails then check you have the right patch go read the Download page again. Once completed run WOFF and go to Workshop menu, check the version bottom right it should display something like "V3.12 4239" when 3.12 has been installed. (click mouse to remove this overlay page). "WINGS: OVER FLANDERS FIELDS ADD-ON PACK #1 : "THE FOKKER SCOURGE" PATCHES: History of Changes: (Latest additions shown first) 3 May 2016 Add-on #1 Fokker Scourge Patch to version 5.0 - NOTE THIS IS ONLY FOR WOFF 3. (WOFF 2 users can still install the previous Add-On#1 Patch 4.0. See Downloads menu section for WOFF2. This is because the later patch relies on content only in WOFF3) 1) Implemented WOFF 3 DM features to the aircraft in this pack. 2) Adjusted models to suit new DX9 shaders cube map features. 3) Reduced Flight Model manoeuvrability to better balance the fight versus Nieuport 11 4) Pilot shadow added to suit shader requirements. also contains all of the following previous updates ; 18 February 2016 Add-on #1 Fokker Scourge Patch to version 4.0 1) Roll Rate loss fix under certain conditions implemented on all aircraft in this pack. Now you have more time to get a hole in the head. also contains all of the following previous updates ; 29 June 2015 Add-on #1 Fokker Scourge Patch to version 3.0 1) DM revision on Eindeckers to match Main WOFF revisions (see WOFF v2.08 history of changes). 10 June 2015 Add-on #1 Fokker Scourge Patch to version 2.0 1) Minor model fixes, engine blur on Fokker EI and EII 2) Fixed gun damage model in Fokker EI and EII . 3) Improved some engine sounds at some RPMs. * * * NOTE: Updates/patches for any product or add-on always includes ALL previous updates for that specific product. So you only ever need the latest patch for an Add-on, and also for the main WOFF you have to get fully up to date! (click mouse to remove this overlay page). 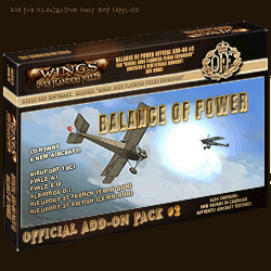 "WINGS: OVER FLANDERS FIELDS ADD-ON PACK #2 : BALANCE OF POWER" UPDATES History of Changes : (Latest additions shown first) NOTE THE LATEST UPDATE IS ONLY FOR WOFF 3 ONLY WOFF 2 users can still install Patch 6.0 (see Downloads section for WOFF2) 3 May 2016 Add-on #2 BALANCE OF POWER Patch update to version 7.0 (WOFF 3 only) 1) Implemented WOFF 3 DM features to the aircraft in this pack. 2) Adjusted models to suit new DX9 shaders cube map features. 3) Pilot shadow added to suit shader requirements. 4) Some model improvements for example Albatros D.I new RPM gauge fitted, minor tweaks. also contains all of the following previous updates ; 18 February 2016 Add-on #2 BALANCE OF POWER Patch update to version 6.0 1) Roll Rate loss fix under certain conditions implemented on all aircraft in this pack. Now you have more time to get a hole in the head. 23 July 2015 Add-on #2 BALANCE OF POWER Patch update to version 5.0 1) Fixed Nieuport 10CI French textures - wording on tail corrected. 12 July 2015 Add-on #2 BALANCE OF POWER Patch update to version 4.0 1) Fixed Nieuport 10CI tail skid sitting too low. 2) Fixed Pfalz A.I and E.III bright prop shaft. 2 July 2015 Add-on #2 BALANCE OF POWER Patch update to version 3.0 1) Fixed F6 views on Pfalz E.III and A.I aircraft. 29 June 2015 Add-on #2 BALANCE OF POWER Patch update to version 2.0 1) DM revision on all craft to match Main WOFF revisions (see WOFF v2.08 history of changes). 2) Added gun-sights to both Nieuport 27's. Minor model improvements. You MUST have Add-on #2 installed already before you can use this patch! * * NOTE: Updates/patches for any product or Add-on always includes ALL previous updates for that specific product. So you only ever need the latest patch for an Add-on, and then for the Expansion or main product to get fully up to date! (click elsewhere to remove this overlay) "WINGS: OVER FLANDERS FIELDS ADD-ON PACK #3 : "MOTLEY CREW" UPDATES History of Changes : (Latest additions shown first) The latest patch as always, includes all previous updates for this add-on. 3 May 2016 Add-on #3 "MOTLEY CREW" update to version 4.0 NOTE THIS LATEST UPDATE IS ONLY FOR WOFF 3, WOFF 2 users can still install Add-on 3 Patch 3.0 (see Download menu button for WOFF2). 1) Implemented WOFF 3 DM features to the aircraft in this pack. 2) Adjusted models to suit new DX9 shaders cube map features. 3) Pilot shadow added to suit shader requirements. 4) Adjusted Fokker D.II FM more like reports - less manoeuvrability. also contains all previous updates ; 18 February 2016 Add-on #3 "MOTLEY CREW" update to version 3.0 1) Roll Rate loss fix under certain conditions implemented on all aircraft in this pack. Now you have more time to get a hole in the head. 14 November 2015 Add-on #3 "MOTLEY CREW" update to version 2.0 Contains the following aircraft fixes; 1) Fixed broken top wings in Nieuport 12. Improved lower wing. 2) Fokker D.II, altered FM - roll was lowered slightly. It was able to compete with other craft too well. The D.II wasn't generally well received and not much improvement over its single winged brother - the Eindecker. Added broken wing modelling to top wings. Added top wing to virtual cockpit (and many other changes) to avoid see-through - noticeable if you lean forward too much or have very wide angle/wide-screen. Adjusted eye-point slightly. Also new and improved pulley system added, and animated in VC (virtual cockpit) more. Moved aileron controls to upper wing in damage system. Other minor tweaks and fixes. 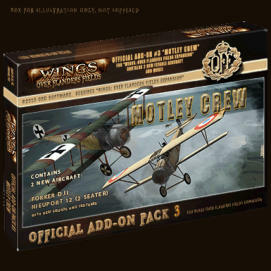 You MUST have Add-on #3 "MOTLEY CREW" already installed and WOFF3 itself up to date, before you can use this patch! * * NOTE: Updates/patches for any product or Add-on always includes ALL previous updates for that specific product. So you only ever need the latest patch for an add-on, and latest patch for your WOFF version to get fully up to date! THIS UPDATES ARE ONLY FOR WINGS OVER FLANDERS FIELDS EXPANSION 3 (known as WOFF3) This page best viewed and used on a PC to enable download of these large files on your PC.